There was a feeling of high energy and enthusiasm all week long as over 600 participants from as far away as Nepal and Sri Lanka met colleagues from Norway, Amsterdam, Ohio, California and so many other Clubhouse communities from around the world. Aside from a wide range of exciting learning opportunities, the welcome reception, anniversary party, gala banquet and special trip to the Red Rocks Amphitheater made for an exhausting but very fulfilling Seminar! Click here to download and view the Seminar program. 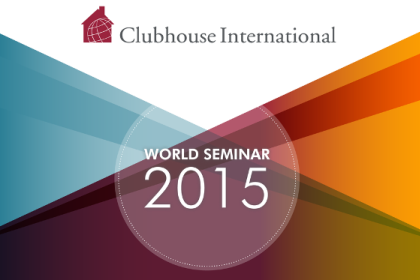 World Seminar 2015 Plenary Speeches. Below are the links to all the plenary speeches that were presented during the Seminar. These speeches covered topics of interest relating to the changing world of mental health, including creating community, promoting healthy lifestyles, employment programs, reaching young people living with mental illness and much more. Click on the relevant link below to download and view the plenary speech of your choice. David Koven (Frontier House): Welcome to World Seminar 2015! Transforming Lives, Transforming Clubhouses: The Power of Accreditation!